Dr. Oca is not one to make decisions lightly. Before she could decide on an EHR, she wanted to see demos on a number of products, including the EHR associated with the practice management system which she has been working with for years. We set up demos for her, most were for preferred vendors of COREC. She also took a look at MedCom EHR, owned by her practice management vendor. The high quality of service provided to her by MedCom, coupled with her dedication to the project made working with Dr. Oca easy. She had a good sense of her meaningful use goals and achieved them within months of Go-live. Dr. Christopher Bui has a practice name Christopher Bui MD, Inc. in the city of Westminster, Orange County; his specialties are Gastroenterology & Hematology. Dr. Bui achieved Meaningful Use through Office Ally in the month of November and to his credit, was very tech savvy and learned his new EHR system quickly. Dr. Bui's practice is very busy, so he’s always on the run, but he always made the time to listen to me talk about Meaningful Use. In an instant, he entered more than 600 patients into the system. 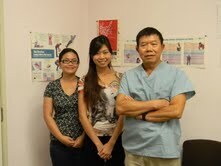 Besides his busy doctor schedule, Dr. Bui is very active in the Vietnamese Community. He was on a dancing show called "A Dancing Dream," and some community medical shows on TV. 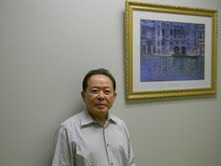 We congratulate Dr. Bui in achieving Meaningful Use and consider him to be a SUPER STAR Performer!!!!!!!!!!!! Dr. Loc D. Bui's practice name is Loc D. Bui M.D. Inc. located in the city of Westminster, Orange County. Dr. Loc Bui has been using Office Ally as a clearing house in the past and started using it as an EHR sometime in January 2012, and is very efficient in it. Dr. Loc Bui was assigned to e2o Health at a time when our knowledge of Office Ally was very limited. Whenever the project manager visited his office, he always shared valuable knowledge about Office Ally that also helped him with assisting other practices as well. We would like to take this opportunity to thank Dr. Loc Bui, for referring other doctors to e2ohealth for assistance in the Incentive Program. In terms of Meaningful Use, for the Core Alternative and Additional CQMs, even though he just needed to select three for each, he did more than was expected. Dr. Loc Bui could have achieved Meaningful Use in July, but due to some technical problems, he closed in August. We are much honored to have assisted Dr. Loc Bui! Dr. Phuc Huy Truong, whose practice Phuc Huy Truong MD Inc. is located in the city of Fountain Valley, is a pediatrician who completed Meaningful Use in August. Dr. Truong, along with his two smart staff, Victoria Van Hoang and Thu Vu, brought a good sense of humor and seriousness about adopting an EHR, which led him to achieve MU. Dr. Truong overcame his disadvantage of slow typing by purchasing a Samsung tablet capable of recognizing handwriting, so he could write his orders and the program would input the information for him. Now he carries it around his exam rooms for charting. As a result of Dr. Truong and his staff’s dedication and hard work, his practice achieved Meaningful Use before the projected date. It was our pleasure and honor to support Dr. Truong and his staff. Dr. Philip A. Lynn, whose practice name is Phillip A. Lynn MD located in the city of Garden Grove, achieved Meaningful Use in September. His specialties are Internal Medicine, Pediatrics and DDS. Whenever Tien Ngo, the e2o Health project coordinator, had a Meaningful Use meeting with him, he always took notes very carefully and diligently. With serious effort he was able to meet all of the meaningful use measures. It was our pleasure to work with Dr. Lynn. Congratulations to Dr. Lynn and his staff for a job well done!!! Altamed Huntington Beach Clinic celebrated with a fruit tart cake and coffee last June 2012 after successfully completing their MU attestation for their clinic. All of the doctors achieved Stage 2 meaningful use. In the center first row are NP Nancy Kavanian in white lab coat and Clinic Administrator Maria Anaya to her right. Dr. Jose Mayorga, Medical Director, is standing on the far right. Congratulations Huntington Beach Clinic for an outstanding job with Meaningful Use!!! Altamed Santa Ana Main doctors achieved Meaningful Use Attestation and qualified to receive their incentive money in June 2012 after months of strong team work with e2o Health staff member Nguyet Nguyen. Nguyet helped them by creating cheat sheets for the MU checkboxes in their EHR program. They celebrated with a fruit tart cake shown below with Dr. Stratton. Shown from left to right are: Dr. Josephine Choa, NP Brenda Flores, Dr. Corazon Stratton, Dr. Khurana Sneh and Dr. Linda Tran. Congratulations to all for a job well done!! !